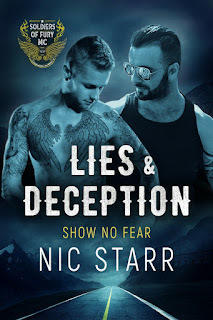 I've read and enjoyed several of Nic Starr's books in the past, and given the opportunity to read the first book in her brand new series was a no-brainer. 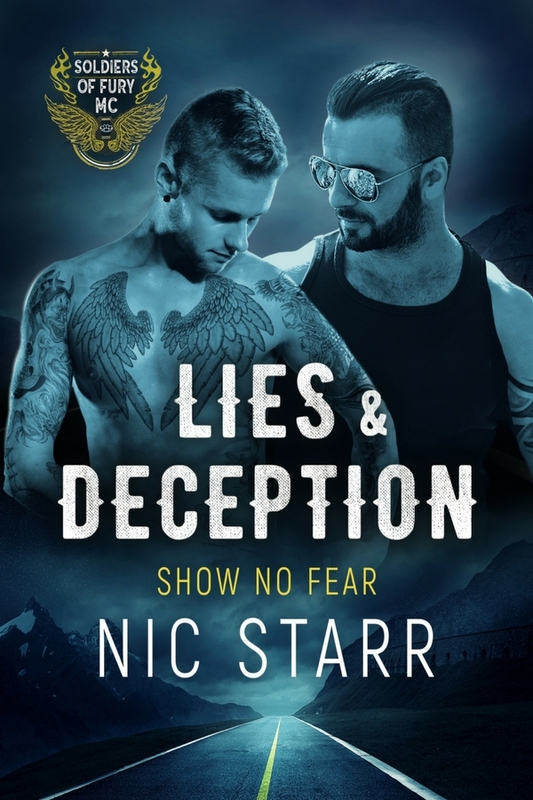 Lies & Deception is the Soldiers of Fury MC series starter and it's the story of a police detective named Mitch O'Neill who goes undercover in order to infiltrate a notorious motorcycle club. His ex-boyfriend having pledge himself to the club provides Mitch with the perfect cover, but how much help can he really get from his drug addict of an ex? As long as he keeps his head down and doesn't call unwanted attention to himself, Mitch should be good to continue digging into the Soldiers of Fury. But then he meets Finn Cummings whose brother just happens to be the club president. Assigned as Finn's driver, Mitch gets up close and personal with Finn, who has promised himself never to have anything to do with his brother's club. When they start falling for each other, will Finn be able to reconcile himself with the idea that his heart now belongs to someone he told himself he'd never become involved in and will Mitch lose the man he loves when reveals the truth about himself? Purchase Lies & Deception on Dreamspinner Press | Amazon | B&N | iBooks | Kobo.